This month, from Atlanta, GA, the King Center announced its "Choose Nonviolence" campaign, a call on people to incorporate the symbolism of bell-ringing into their Martin Luther King Holiday observance, as a means of showing their commitment to Dr. King's value of nonviolence in resolving terrible issues of inequality, discrimination and poverty here at home. The call was heard in Kabul, Afghanistan. On the same day they learned of the King Center's call, the young members of the Afghan Peace Volunteers, in a home I was sharing with them in Kabul, were grieving the fresh news of seven Afghan children and their mother, killed in the night during a U.S. aerial attack - part of a battle in the Siahgird district of the Parwan province. The outrage, grief, loss and pain felt in Siahgird were echoed, horribly, in other parts of Afghanistan during a very violent week. My young friends, ever inspired by Dr. King's message, prepared a Dr. King Day observance as they shared bread and tea for breakfast. They talked about the futility of war and the predictable cycles of revenge that are caused every time someone is killed. Then they made a poster listing each of the killings they had learned of in the previous seven days. They didn't have a bell, and they didn’t have the money to buy one. So Zekerullah set to work with a bucket, a spoon and a rope, and made something approximating a bell. In the APV courtyard, an enlarged vinyl poster of Dr. King covers half of one wall, opposite another poster of Gandhi and Khan Abdul Gaffir Khan, the "Muslim Gandhi" who led Pathan tribes in the nonviolent Khudai Khidmatgar colonial independence movement to resist the British Empire. Zekerullah's makeshift "bell' was suspended next to King's poster. Several dozen friends joined the APVs as we listened to rattles rather than pealing bells. The poster listing the week's death toll was held aloft and read aloud. "January 15, 2014: 7 children, one woman, Siahgird district of Parwan, killed by the U.S./NATO. January 15, 2014, 16 Taliban militants, killed by Afghan police, army and intelligence operatives across seven regions, Parwan, Baghlan, Kunduz, Kandahar, Zabul, Logar, and Paktiya. January 12, 2014: 1 police academy student and one academy staff member, killed by a Taliban suicide bomber in Kabul on the road to Jalalabad. Jan 9, 2014: 1 four year old boy killed in Helmand, by NATO. Jan 9, 2014: 7 people, several of them police, killed in Helmand by unknown suicide bombers. January 7, 2014: 16 militants killed by Afghan security forces in Nangarhar, Logar, Ghanzi, Pakitya, Heart and Nimroz." We couldn't know, then, that within two days news would come, with a Taliban announcement claiming responsibility, of 21 people, 13 foreigners and eight Afghans, killed while dining in, or guarding, a Kabul restaurant. 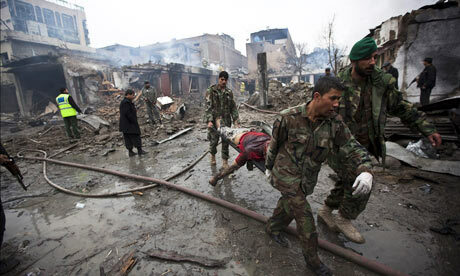 The Taliban said that the attack was in retaliation for the seven children killed in the airstrike in Parwan. ... A true revolution of values will soon look uneasily on the glaring contrast of poverty and wealth. With righteous indignation, it will look across the seas and see individual capitalists of the West investing huge sums of money in Asia, Africa, and South America, only to take the profits out with no concern for the social betterment of the countries, and say, "This is not just."... The Western arrogance of feeling that it has everything to teach others and nothing to learn from them is not just. We must never forget the full range of Dr. King's vision, nor the full tragedy of the world he sought to heal, nor the revolutionary spirit which he saw as our only hope of achieving his vision - making do with everything we have to try to keep freedom ringing, despite the pervasiveness of the evils that beset us, and a world that needs vigorous effort to save it from addictions to tyranny and violence practiced by reckless elites.